Dr. Romo is an expert when it comes to problems of the spine and offers highly effective treatment for disc challenges, including sciatica. 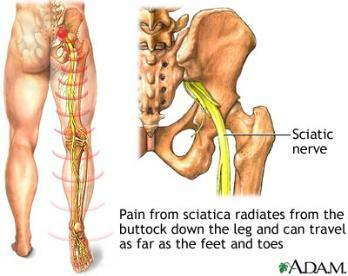 sciatica is an extraordinarily painful condition. If you suffer from sciatica, you are, sadly, all too acquainted with the deep pain that is constant during your waking hours and interferes with your daily activities. Sciatic pain commonly travels from your low back, through the buttock(s), and down the large sciatic nerve in the back of your leg(s). Many times, the pain can even travel into your knee. Sitting, as well as motion, can generate pain. Occasionally lying down will reduce, or perhaps temporarily get rid of the pain. However, sciatica will not be remedied without suitable care. The clinical diagnosis of sciatica is referred to as a "radiculopathy", a medical term that means simply that a disc has protruded from its usual position in the vertebral column and is putting pressure on the radicular nerve (nerve root) in the lower back, which forms part of the sciatic nerve. Such pressure is especially painful. Added pressure on the intervertebral discs, as well as imbalances in the muscles encircling the spine, can occur during and after extended sitting, especially in a awkward position. In general, a precise event or definite injury doesn't produce sciatica, instead it tends to come about over time as a by-product of general wear and tear on the structures of the lower spine. Eventually the lower spine loses its capacity to function normally during everyday stresses. Ultimately, the intervertebral disc develops small fissures, or cracks, which then allows the soft nucleus to extend the disc outward. If the disc presses on sensitive tissues, it generates the pain that is often referred to as a ruptured disc. If the disc puts pressure on the spinal nerve, an individual can develop sciatica. Most disc challenges, including sciatica, can be corrected with chiropractic adjustments and therapies that frequently includes postural exercises. If you are suffering from sciatic pain, it is essential for you to seek help from your chiropractor.